As promised, here are some more pics of "P Moreau et Fils" on which the little compressed air loco under construction was photographed. 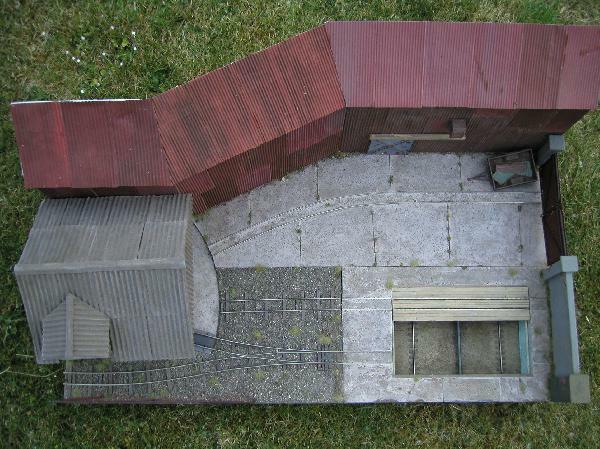 The track plan, with a sector plate in the corrugated asbestos building and a traverser in the factory yard, was inspired by "Cycles le Berlan" by Francoise Fontana, which was in turn inspired by "Carl's Imports" by Carl Arendt, both featured in Carl's Small Layout Scrapbook. Sorry it's so bare, I forgot to put any stock or figures on it when I dragged it out into the garden to photograph this evening. 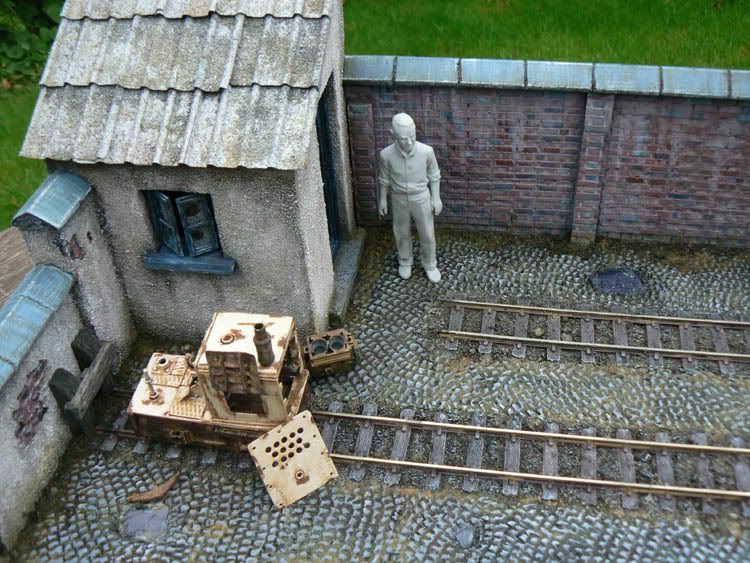 It's a lovely little layout Les. I had the privilege of driving it when it was shown at ExpoNG. I love the fact that its simplicity does not detract from the fun of operation. Very effective. It looks great, even without stock and figures. How did you make the concrete? Location: Martins Ferry, Ohio, U.S.A. Very nice! I had to look twice to be sure it was a model! The outdoor photography compliments the model work excellently. The basic operating posibilities are appealing too. This is something I'm beginning to think about as I increase my collection of locos and rolling stock. Thanks for the great look! Stumpy wrote: Very nice! I had to look twice to be sure it was a model! absolutely fantastic.Love the simplicity of it which just brings it more to life.Great detail work on the yard an buildings. Will be stealing ideas from you. Fantastic modelling. Even bare of the electric actors I spend quite some time looking at all the detail and variation of surfaces you have captured. Your usual standard Les. Shame I can't be at MOMING'09 to see it as my driver has plumped for a day out with the Gnorfolkers. Thanks for the really nice feedback guys! I think photographing it in natural light outdoors helped its appearance. Stopped all the rust looking too orange and overpowering perhaps. Incidentally it's my first layout built entirely from foamboard. Very quick! The basic baseboard took an hour and a half to cut the parts and stick them together with a hot glue gun. Glen, the concrete panels started as rectangles of cardboard cut from cereal packets. They were stuck down, painted "concrete" colour (mucky grey) then sprinkled with ground pepper while the paint was still wet to give some texture. When the first coat was dry, I gave it a wash with thinned paint in a slightly different shade. That was about it, although I sometimes draw on a few random fake cracks with a pencil. The weeds in the joints between the panels were pieces of cheap hanging basket liner for the longer stuff and bits of ordinary ground cover for the small weeds. Can you tell me what you have used for the 'wire' fence along the front. Great looking layout Les The natural light from photographing outside gives it a realiy authentic look. Thanks Simon, The natural light makes a huge difference. It's very flattering to a small, not that particularly special, scene. Richard, the frame of the fence is plastic kit sprue and the "wire" is from supermarket polythene mesh vegetable bags ( I think onions from memory), so it was all free. I sprayed it with red oxide primer, which seems to have stuck. A wonderful vignette Les. How did you acheive the asbestos corrugated sheeting? Yes, it is fun seeing this come together. Well, granted, a lot of it is together already, but the story is now being told. Les, thanks for the info on the fence. Simple but very effective. Really sorry Michael, I'd just gone on holiday when you posted your question about the asbestos sheeting in June and by the time I got back 2 weeks later the thread had practically disappeared off the radar, such is the speed of activity on this forum. Only saw it when I re-checked the thread today ahead of MOMING on Saturday. 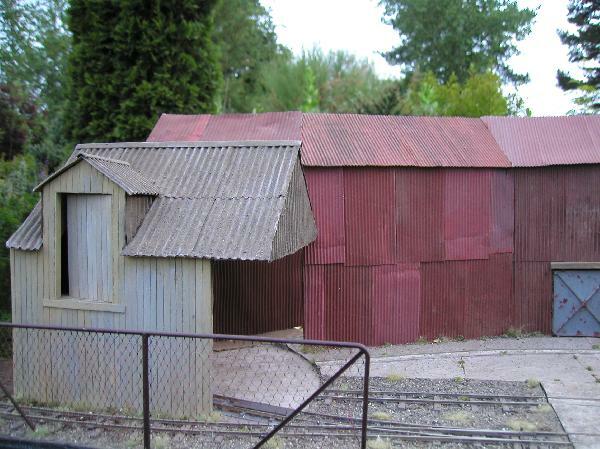 Anyway, excuses aside, the asbestos sheeting was more corrugated cardboard centre, of a larger gauge from that used to do the corrugated iron sheeting. I guess you'd call it regular corrugated card size, in fact. Sprayed it with grey primer and while wet scattered it with a mixture of seived dried sandy soil from my garden. 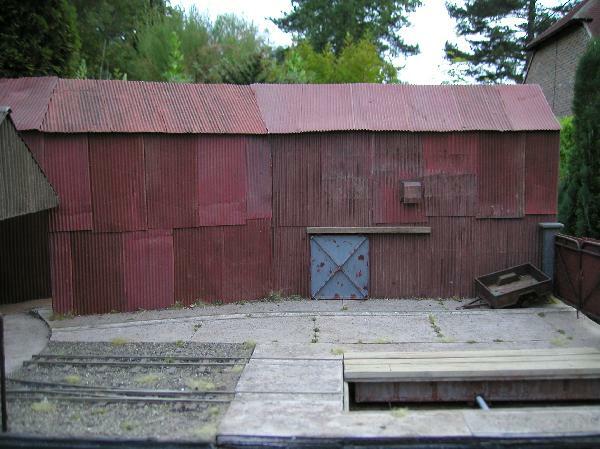 Then when dry applied thin washes of browny-grey acrylic, as close in colour to weathered asbestos cement as I could mix, until it looked about right. Les, sorry for jumping in on your thread - super layout by the way, don't know quite how I missed it before . My method for corrugated asbestos almost the same as yours - although I used Steve' famous chinchilla dust to get the texture and then washes of gouache color. In my case I needed the type of sheet you used to find in the UK which had flat areas between the ribs - this was formed using thick aluminium foil over a master made out of wood and tubing. Last edited by gfadvance on Wed Aug 12, 2009 6:59 am, edited 1 time in total. You better be careful Gordon, Mesothelioma Law Suits can get expensive. Les thanks for the answer, Gordon super job! well I have to say,not only is the roofing superb,but the rest of your execution as well.Thank you. 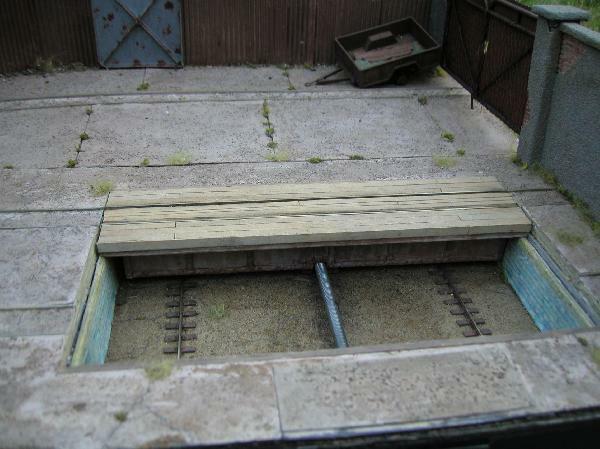 I must confess I pinched your idea for doing crumbling rendering using PVA glue and sand, which you described on a thread last year, and used it on the front right hand wall pillar on my layout (sadly only visible in the overhead shot). It really works. Thanks! Congrats on getting into Carl Arendt's Small Layout Scrapbook, Les!